Violet Township is excited to announce the purchase of the Wigwam, an exclusive secluded gem that was previously owned and operated by Wolfe Enterprises, Inc. The complex, located at the northwest corner of Blacklick Eastern Road (SR 204) and Taylor Road, dates back to the early 1920’s. The existing facilities are rich with history, charm and purpose, and will be preserved and utilized to benefit the Violet Township community. Wolfe Enterprises, Inc., through Capitol Square, Ltd, its real estate division, was actively exploring commercial and residential redevelopment options for the property. The Township was concerned about the potential loss of the existing structures and approached Capitol Square with an idea of purchasing the complex. The Township and Wolfe Enterprises, Inc. worked collaboratively on a purchase agreement, and the Township took possession of the property on July 16th. The Township’s vision is to preserve, showcase, and utilize the complex to its fullest capacity to benefit our government operations and our community. There are a total of 21 buildings on this site, which include an original lodge, a 303 seat theater and a large banquet hall. There are also approximately 10 acres of prime real estate fronting on Interstate 70 that the Township intends to market for future economic development purposes. 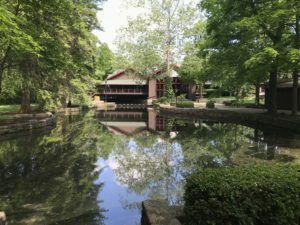 The Township will transform the original lodge into its administrative offices and plans to rent the theater for the community theater events, dance recitals, small venue concerns, holiday pageants, and public meetings. The banquet hall, which can comfortably seat up to 400 people with tables and chairs, will be rented for weddings, conferences and other corporate and community events. These rentals will serve as an economic development driver for the community. The northern 10 acres with frontage on Interstate 70 is planned to be developed in the future in partnership with the Violet Township Port Authority. The township envisions targeting uses, such as a hotel, that are compatible with and can be supported by the overall use of the property. Office and other professional business uses will also be pursued for the future development of this area. The Township also plans to relocate the Fairfield County Sheriff’s Office, Violet Township substation to this property and reserve approximately 2 acres for a future fire station. It is also the intent to preserve the existing 26 acres of woods along Blacklick Eastern Road. “This brings an entirely new dimension to our community for our residents to enjoy in many ways. We will now have an additional performing arts venue and large meeting space. The property also includes approximately 20 acres of woods, and part of our vision is to preserve and convert this area to walking trails and a shelter house” said Darrin Monhollen, Violet Township Board of Trustees Chairman. Violet Township staff have already started the process to convert the lodge into the township offices. Work has also begun on the banquet hall to include video screens and upgrade the sound system to make it a state of the art event venue in the Central Ohio region. Work will continue over the next several months with the intent to open this facility to the public in 2019.